Springtime Trimming, Is it Time Yet? So it is mid to late Winter in Austin Texas and as usual you cannot decide if it is Spring or Winter (hot one day, cold the next, sometimes in the same day) and you are jonesing to get in your garden! A little landscape advice from a well seasoned professional,…Don’t be too eager to trim back your perennials just because Mother Nature cannot make up her mind about the weather. The fact is that we very often will get a late season freeze and you may be trimming off the only protection your plant has. Another really important fact is that if your landscape company or lawnmower guy is telling you it is time, this is their downtime and they are looking for billable hours. Make sure you know when the time is right. While that lawn services might be excellent at mowing and mulching, it does not mean they know plants. If the person/s you hire cannot give you the name of the plants and trees they are trimming, do not let them trim unless you know their growing habits and can show them the proper way. Hard pruning a flowering shrub late Winter/early Spring (once flowers are already set) may mean you lose all of your Spring flowers. Trimming your fruit trees too late in the season means you will lose the fruit on those limbs, trimming a woody perennial plant to the ground means that you have lost years of growth or may cause death, etc. 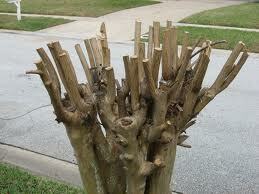 Cropped Crepe Myrtles are a perfect example of landscapers and home owners not knowing proper trimming techniques. Crepe Murder- Absolute No, No! This photo is a classic example of a bad trim that leads to irreparable damage. It is important to know the proper trimming techniques and timing and this can be found online, (below) and by hiring a landscape professional like my self to train you. I offer educational landscape consultations where I teach you how to care for you trees, shrubs, plants and lawn and the information than can then be shared with your landscaper, or lawn service for the best results. The tree above will never look the same, and can no longer hold the burden of the flower and seed pods because it has been structurally damaged. Remember that the dead branches and leaves that are left behind from Winter are protection for the roots of your dormant (still sleeping) perennials and trimming your perennials sends them a message that it is time to start growing. New foliage will later be burned by a freak cold snap, so be sure to check your extended forecasts and when possible, wait until at LEAST late February, early March( in Texas) to do your hard pruning. When the time is right and your extended forecast looks like the coast is clear, you can begin to trim and your plants will give you the cue. You should now be seeing lots of green appearing at the ground level, along the stems of woody limbs and branches, and from the seemingly bare ground (bulbs and such). You are also going to find a whole lot of dead leaves, and burned branches, so be sure to use those in your compost pile or bag them up for the city to recycle whenever possible. For detailed information on trimming techniques, please check out this link ! I don’t think it made any difference to my plants. They were going to come out whether or not I pruned them. The S. leucantha has already been hit by frost and no doubt it will happen again tonight. Well I have pruned mine as well and only caution for those who have plants that are dear to them and could be injured further into the season. My Pride of Barbados, Esperanza and Turks caps hardly died back at all this year because of our mild Winter and I decided to wait on those in case we got a late freeze, which we will. The main point I am making is for plants that are under 3 years of age and are more tender perennials. The old stand by’s can take a beating and will just mean a later bloom. Lets hope it isn’t as cold as they are threatening, I already have all my veggies planted! Thank you for this Lisa. I was just asking myself whether or not to get the yard guy to do some trimming. As always, you provide very useful tips. Wish I cold have predicted we would have our Winter in March! This is reaoly interesting, You are a very skilled blogger. ykur magnificent post. Also, I’ve shared your site in my social networks!